I was just fooling around with the shells and wood, arranging them in different ways, and suddenly it looked like a hexagram. This is totally the way I generally operate in all of life; I start out going north and end up somehow in the southwest. So. I randomly arranged and photographed my beach I Ching for some time. 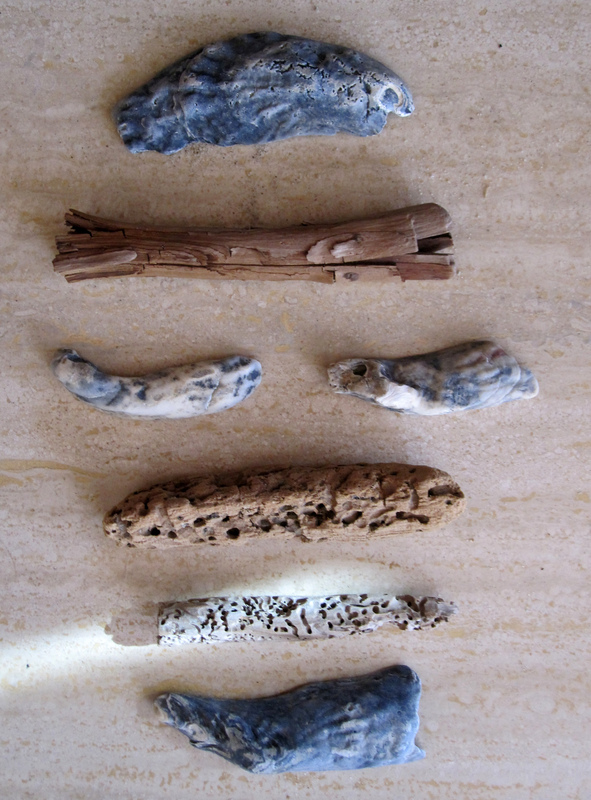 I don’t know enough about the I Ching to have recognized the meaning of what I was making. But I do own 3 versions of the I Ching, including the classic Wilhelm translation that I’ve probably had for 40 years. Home again, books out, to decode the first one. I found the words very appropriate to what Nina and are doing with our blog. I’ll sprinkle more of them in occasionally in future posts. 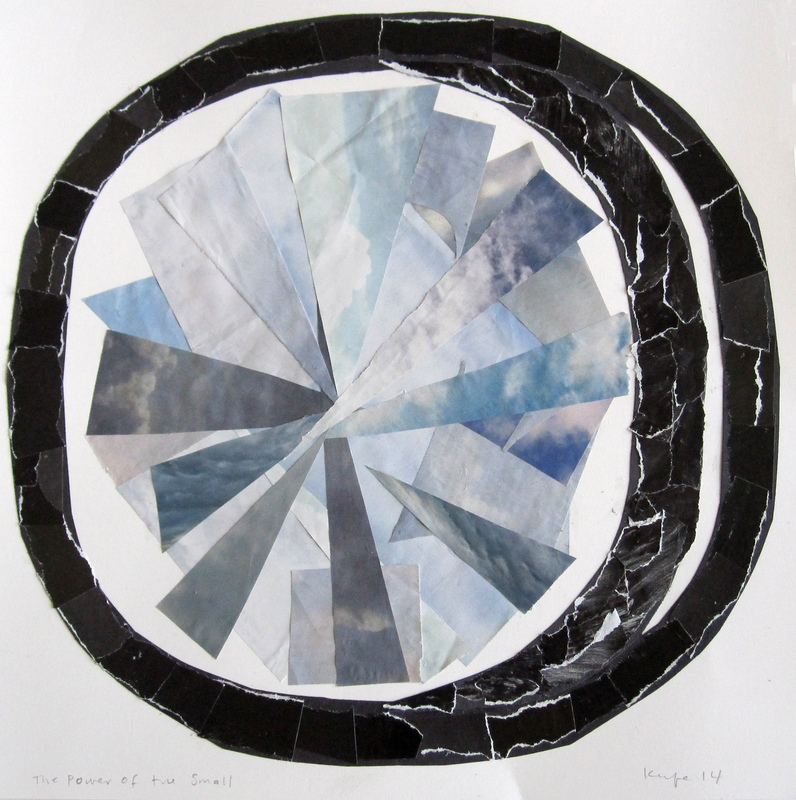 And of course the words and descriptions of the hexagram made me want to do a collage–OK, nearly everything makes me want to do a collage–so I did, and I’ve included it too. 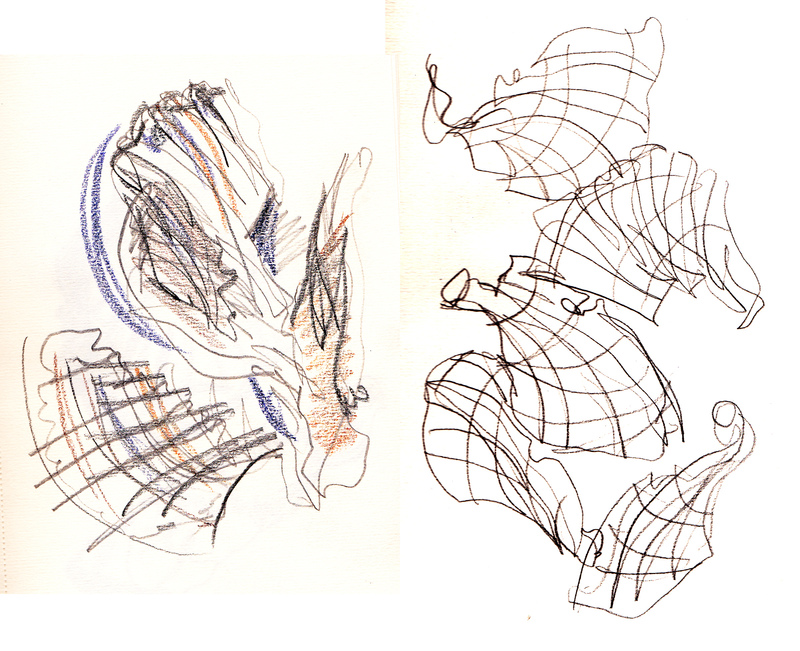 As the week went on I became a bit more abstract in my interpretations. The lines and curves of the scallop shell pieces encourage motion. Every day I took a walk on the beach and collected shells, and sometimes other things like pieces of horseshoe crab and wood, in my bucket. 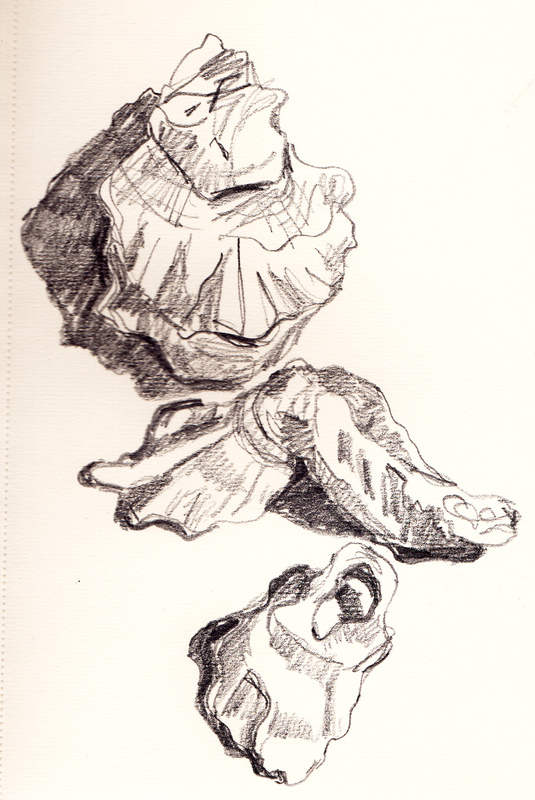 I washed them off and let them dry, and in the evening I would draw. 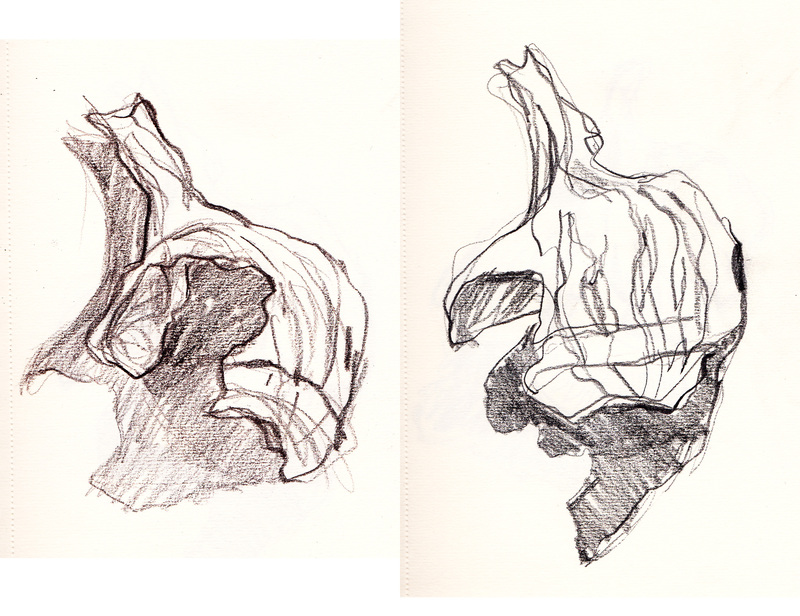 The first night I started with one conch piece and drew it a few times from several viewpoints. The shadows made by the irregular edges were interesting too. 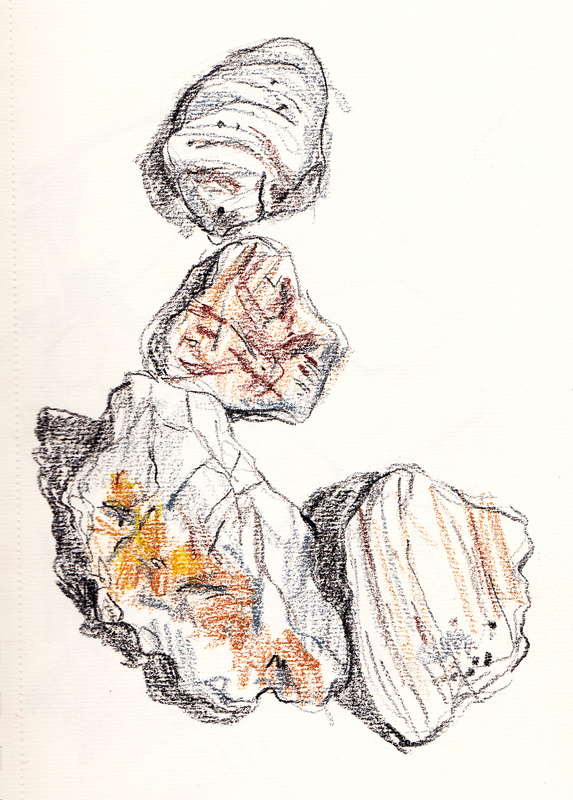 We took the ferry to Okracoke Island and found many many interesting oyster shells there. 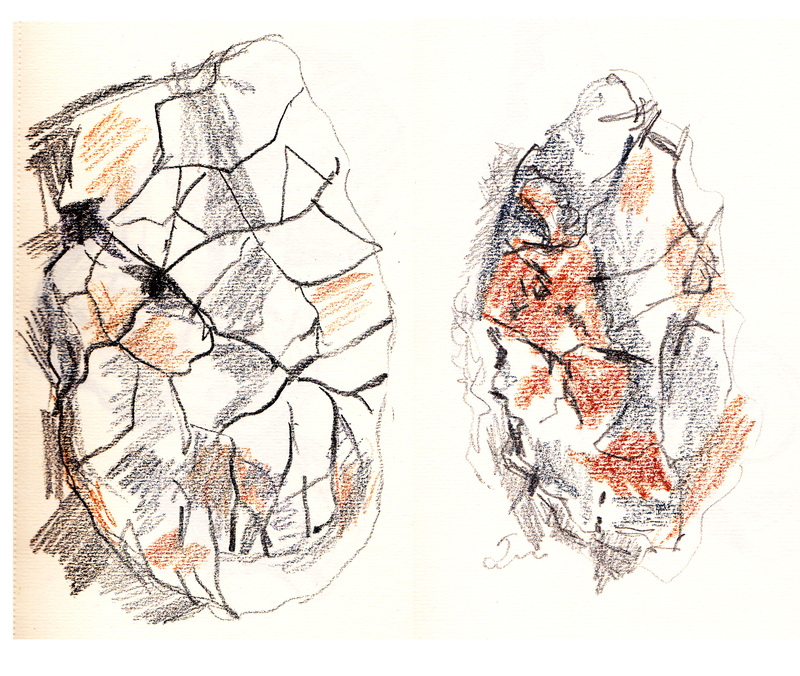 I also really enjoyed sketching the water-worn shells, full of hieroglyphic-like marks. I’m the window designer for a boutique in Montclair, NJ. CoCo is celebrating sixteen years so I did a Sweet Sixteen window for them. Kind of hard to photograph because of the glare. It looks better at night. Beautiful week at the beach. 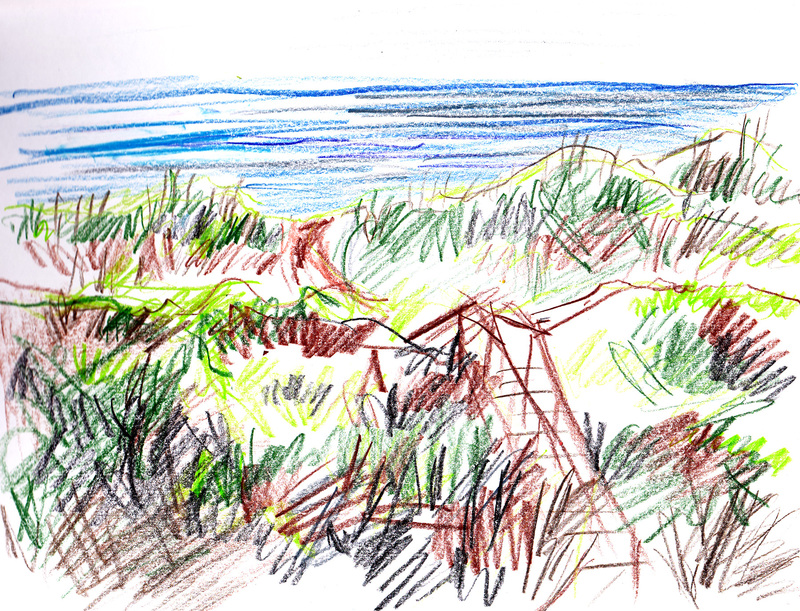 The deck looked out over the dunes and the ocean, and I sketched it a few times. 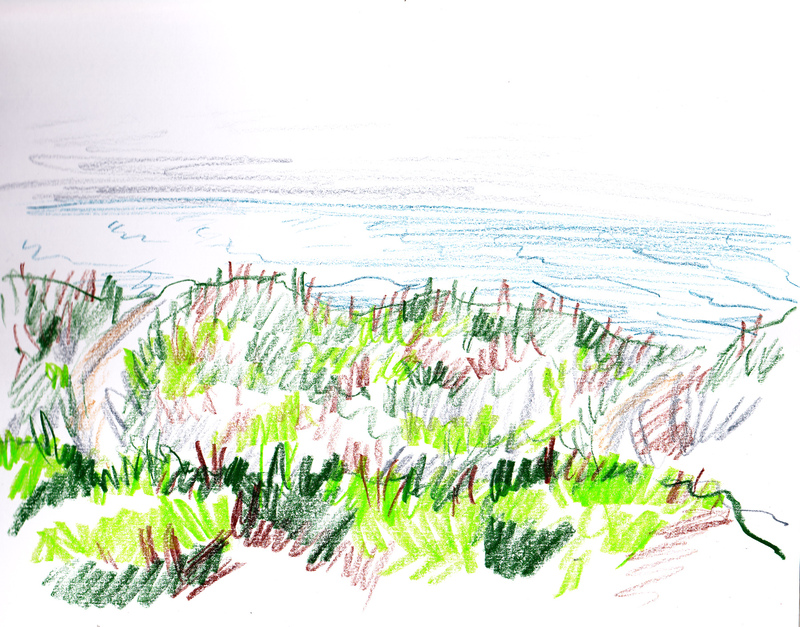 Although most of my artistic endeavors involved shells…every day I would take one or two long walks up the beach and back with my bucket, and at night I would sketch. Later I did shell arrangements and photographed them. The rest of the world falls away without hours on the computer and the news of the world. I did borrow a laptop and check email a few times, but mostly all of us went to the beach and sat or went in the water or wandered or tossed a ball or Frisbee around or messed around in the sand or watched the wildlife and other beach goers. We cooked some great dinners, and maybe we would watch baseball a bit, and read–I went through two books. Many many birds. I was surprised to find a cardinal who sang constantly. Blackbirds, including red-winged blackbirds, crows and grackles. Mockingbirds and cat birds. And the shore birds, plovers and sandpipers and gulls and pelicans. The crabs on the beach are also worth watching. Another from the Paterson series, gouache, ink, old textiles and newspaper clippings from the 1950 Paterson Morning Call. I like the little memorial clipping in the bottom right hand corner which reads “In loving memory of our dear baby, Raymond Swan, who left us March 13, 1926. Gone but not forgotten. Sadly missed by Mom and Dad.” Although Mom and Dad are surely gone now also, I like to think that I’ve memorialized baby Swan in this painting. Another from the series done with Paterson textiles, newspaper clippings from 1950, gouache, watercolor and ink. The skeleton is that of a frog. I like the old advertisement which reads “A hearing aid is a mark of intelligence. It shows consideration for others. This was just a floating consciousness kind of drawing. When my mother died I said to my husband “but it looks like she is still breathing”. It was just wishful thinking. He told me it was a common feeling to have. The vertical strip down the center is a broad silk made by my grandfather. The newspaper clippings are from a 1950 Paterson Morning Call. The theme, obviously, is nature. I like this one a lot. This is one of a series of collages made with old textiles and newspaper clippings from the Paterson Morning Call. I found the old textiles wrapped in the newspaper; I believe they were saved by my grandfather who had a factory in Paterson. The flowers and basket are textiles. I wanted to commemorate the Allied Textile Printing factory, which today stands in ruins.